So, for the cover I was thinking “fear”. What are the two things you are most afraid of attacking this building right now? A small space ship firing a pretty standard laser, that’s scary, right? But what, get this, if it came with a friend? A giant legionary‘s sword! If that cut into your building you’d defecate yourself right there and then! I really don’t understand what is going on here. Is the sword a symbol of the lasers power? Is damcoles a Latin thing? Hence the roman style sword? I suspect the ‘ultimate weapon in the wrong hands’ was actually the canvas of the person who designed the cover. I think I’m insulted that they had to include the sword. I get the satellite and it’s laser attacking the White House. The sword with ‘Damocles’ written on it assumes the reader of this book is an idiot. In which case, I’ll pass on reading the book. hmm, im not sure i understand… are you saying that at no point in the story does a 100m tall sword crash into a building that looks vaguely like the White House? The cover is a picture knife sitting on top of a picture of a satellite shooting at (and being flung toward) the white-houseish building. Notice the shadow. Why the owner of the knife would leave it on top of that picture is beyond me. Well, if the book follows a traditional story arc…I’d say you can expect 100m tall sword to appear round about Chapter 8. The shadow on the sword is quite confusing. It looks like the laser thing is about to crash into it. I’m with Bryce, the knife is ment to be on top of the picture of the laser shooting the building. I am assuming that this is ment to create a kind of 3D feel or something though mostly it just looks foolish. I took me a couple of looks to realise that the Operation at the top had any connection at all to the Damocles on the knife. In a rather silly moment I just thought they’d randomly decided to right Damocles on the blade in rubbish font. Although on closer inspection, the sword is slightly opaque. Combined with the drop shadowing, this means we are looking at a highly customised mouse pointer. Incidentally, if you’re reading the book and you skip a page, does Oscar L. Fellows’ nose light up? Stop blathering about that sword. I’m surprised nobody has said anything at all about the huge blue planet in the background, hanging over the White House like a, er… sword of Damocles. What I like about this cover is, it’s so subtle. PLUS, the White House is now in SPACE! Oil is to water like subtlety is to Baen book covers. Typically parochial Americans: they have a functioning SDI but they bring it down from orbit to tackle a big knife attacking one building in their capital rather than the giant sodding planet about to crash into Earth. You’d think that by definition the ultimate weapon is ALWAYS in the wrong hands. But of course what the blurb really means is “in non-American, non-WASP hands”. Sixteen “humerous” comments about a cover!!! As an ignorant but friendly American, may I assume that the 16 commenters are stoned on something, or that there is some ethnic secret parlance going on between an erudite gang of mates, rather than there is some magical power emanating from this cover art that attracts simple Three Stooges aficionados? Mates we may be here in GSS, united in our love of SF and laughable covers, but is isn’t like we know each other in, like, real life or anything. @Lee Fellows – Touché, sir. I have nothing to say in our defence. I promise you, we shall not make fun of any of your other books. So we’re stoned and “ethnic” just because we have a sense of humor and a sense of artistic proportion? Those are very… particular… insults. And I’d think a professional writer would know that “erudite” and “Three Stooges” don’t go together. And could spell “humorous”. And why’s the author so insulted when we said absolutely nothing about the content? Was I stoned? Certianly not good sir! Was I drunk at 10am… wellllllllllll…..
@SI: And why is the blade translucent? You can see some of the Space White House through it. 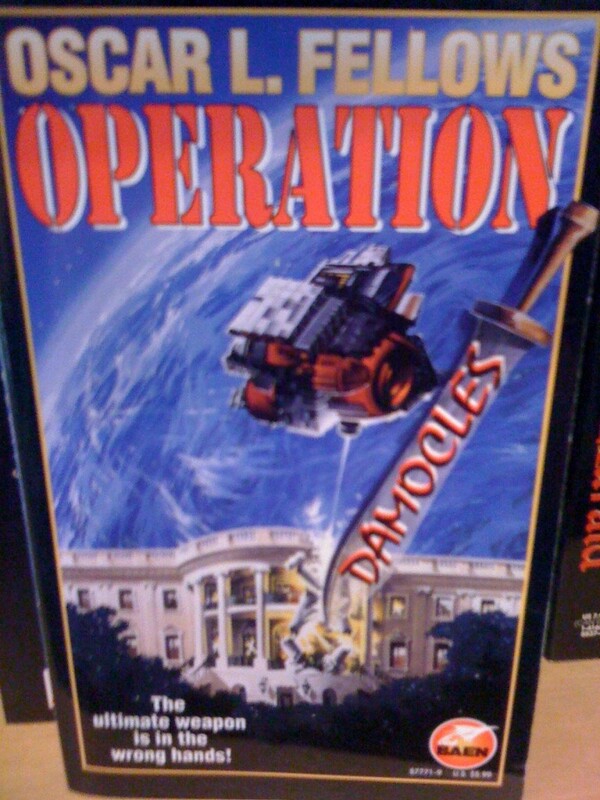 I think @Bryce (4) is correct; the plastic or glass bladed sword is lying on top of the photo of Space White House In Orbit being zapped by laser satellite. Maybe it’s a letter opener, owned by a guy named Damocles, atop his photo. Not to mention that’s a Roman sword and Damocles was Greek, of a date somewhat preceding the development of this style of weapon. Which wasn’t see-through. @Lee Fellows (17)—Your apparent failure to recognize the genius of the Three Stooges is clear proof you will never “get” GSS, nyuk, nyuk, nyuk! @BC (23): Why, I oughta! @GSSxn—Our ethnic secret parlance . . .
@BC: AFAIK, most of us aren’t “ethnic” at all. I mean, yes, everyone’s got some ethnicity but we seem to be a largely Anglo-Saxon lot, at least in culture. I myself am nearly as translucent as yon sword. And many of us are even American. Ethnicity doesn’t matter when it comes to Los Tres Chiflados. Slapstick works world-wide. Everyone likes سه نخاله. I feel totally chastised, chin flipped, face slapped and woo woo’d. And, just for the record, Tag, there are three other books. You might like the cover of ‘Catalyst’. And quite possibly the story behind it. I look forward to seeing your comments on the submarine and missiles hitting the really big drop of water…or whatever liquid that is. @Lee Fellows – Thanks for being a good sport. And welcome to snark boot camp. Drop and give me ten [bad puns]! That’s the spirit, Lee! It’s all in fun, snarky, snarky fun – even Curly Joe DeRita wouldn’t take umbrage! Sorry, Oscar — self-published works don’t fit the rules here. Even if they do have what sounds like MS Paint clip art covers. The artist’s work seems to be of varying quality — he had some quite good ones, some solidly middle-of-the-road ones, and some terrible ones. I’ll give you one guess as to which publisher used the worst typography on top of his work. So apparently he’s doing well at that and no longer is at the mercy of publishers. Good for him, I say.